The ZBII is a self-propelled 2-row top lifting harvester with bunker. This harvester is highly manoevrable, has a 9 m³ bunker and impresses with its small turning radius. The ZBII is standard equipped with two hedgehog units. Thanks to the large surface area of the hedgehog units and the ability to change the speed and inclination angle, work can continue with optimum efficiency even in changing conditions. 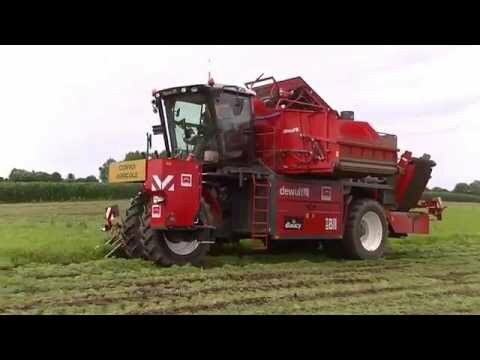 For more than 50 years no other harvester has exceeded the expectations of carrot growers and contractors as much as the Dewulf top lifting harvesters. Comfort and ergonomics have been given new meaning. Thanks to an excellent view of the harvesting elements, the harvesting experience with the ZBII is sublime. The harvester is easily operated by means of a multifunctional joystick, harvesting control-unit and drive control-unit.